Once the ringing in my ears stopped, the headaches and dizziness did too. Do you hear a ringing, roaring, clicking, or hissing sound in your ears? Do you hear this sound often or all the time? Does the sound bother you a lot? If you answered yes to any of these questions, you may have (ti-NIGHT-us or TIN-i-tus) and you should see a hearing professional. Tinnitus therapy is designed to help you manange the noise in your ears. Hearing Loss – Most people who have tinnitus also have some kind of hearing loss. Loud Noise – Exposure to loud noise can cause permanent hearing loss and tinnitus. Continued exposure can make the tinnitus and hearing loss become worse. 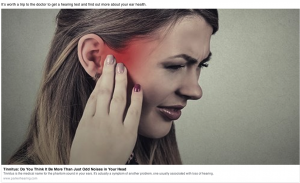 Medication – More than 200 medicines, including aspirin, can cause tinnitus. If you have tinnitus and you take medicine, ask your doctor or pharmacist whether your medicine could be the cause. Hearing Aids – Hearing Aids may create dual benefits, by enhancing hearing and/or “masking” the tinnitus. Over 60% of hearing aid users report partial or complete relief from their tinnitus when wearing their devices. Drug Therapy – Certain medicines may provide some relief from tinnitus. Nutritional supplements may also provide additional relief. Sound Therapy – Many hearing instruments now incorporate some form of sound therapy for tinnitus sufferers. Different types of noises or chime-like sounds can be used with or without amplification to offer relief from tinnitus. Sound therapy will most often be accompanied by education, counseling, and stress reduction. It may also include professionals from other disciplines (i.e., psychology, dentistry, neurology, etc). This new approach is proving to be very successful and is being used more frequently by the hearing professionals in our office. First and most importantly, schedule an appointment to have your tinnitus evaluated. There may be other medical issues behind the tinnitus, and it is important to rule out anything else that may affect your overall health. Great! Just call 310-540-4327 to schedule your appointment.